Here I sit, planning my 2nd week of lessons for my junior primary classes. I must keep in mind that many students are preliterate, especially the brand new reception students (5 year olds)! I have been searching online for activities suitable for preliterate students and stumbled across these 2 inspiring videos. While Erin’s students are definitely not new reception students, I love how she supports everything she says with text and/or illustrations. This reduces the cognitive load for her very young students by supporting comprehension. Ingenious. Erin uses so many techniques that are perfect for R-2 students. Watch and enjoy! PS. If the links don’t work for you, google Erin Gotwals part 1 & Erin Gotwals part 2. Agen has been absolutely amazing! In 15 minutes, an evening coaching session is starting downstairs in our hotel which I’d really love to get to, so hopefully I can quickly squeeze this in before heading off! I would like to blog about the sessions I’ve attended here at the TPRS Conference in Agen, both to clarify my own personal understanding and also share what I gleaned. I hope I can do them all justice and explain them clearly. Behind Judy, through the window, was the back of the cathedral; so gorgeous. Students need to earn points in language classes to watch a film in the target language – thus being rewarded with input – and set the subtitles to Indonesian! Written and aural input. Movietalks – watch before stopping at significant places to PQA. You can then create an embedded reading from this conversation. Judy shared how she also used the dialogue from a scene discussed in class by typing out the significant sentences, printing them off and then cutting each sentence in half. Students work in pairs to match up the halves and then put them into the correct order! The completed text becomes a synopsis of the scene which is by now fully comprehensible! Diane Neubauer recommended Simons Cat clips with their repetitive actions. Carrie had a great idea for preparing for a relief teacher. Before the absence, show students a trailer for a film and discuss with students their ideas about what the film could be about. With the TRT, students watched the movie and then upon return, the language teacher again shows the trailer and pretends they want to know more about the movie – thus having the students do a group retell of the story!! Very important to remember that the films shown in class must be enjoyable for several reasons but most importantly; you, the teacher, will not want to plan a unit around a film you detest watching! Take a screen shot of a movie scene (preferably one with action) before showing students the film and have them predict what the movie might be about. Judy only uses films in her classes that use the language that she is teaching. Students don’t hear the language if they are reading English subtitles. Diane recommends having (Target Language) subtitles on while watching a film because it allows you to stop a film and discuss/PQA/comprehension check/read the language at the bottom of the screen. A good way to explain common Indonesian phrases that are unfamiliar to non Indonesian people. The focus of the film is what is needed for comprehension and whatever is not important is simply translated. Judith’s goal with using films in her classes is to motivate her students to continue watching the films independently in their own time for pleasure! Judy recommends ‘The Mighty’ as a film to watch with students as there isn’t that much conversation. The Black Stallion is another film with minimal talking. Great to use a film that was made from a book because of the discussion created when comparing the 2. e.g. Hunger Games. Quirky commercials would be perfect for movie talks. Stop the film when there is a close up of a character not speaking – maybe listening to someone else or thinking – and PQA what is he thinking? How cool would it be to study a film in fourth term and then finish the year by showing the full film to the students? Plan movie talks for tricky/tiring times of the year and minimise the workload where possible to do exactly the same film with all year levels! Have a text for students taken from the film with a sentence missing from it. Give the sentence to students and they have to listen to the dialogue of the movie again and again to see where it fits in. Hand out to students the dialogue between the characters from the film and students have to add in the names of the characters speaking. Very important to come up with ways for the students to listen (willingly) to the dialogue in the films repeatedly in compelling ways. Students have to create the script for a scene. Requires listen repeatedly to the scene to get it! The background context of the story is ongoing and as students move through the film, it becomes very familiar and contributes to comprehension – setting, characters, storyline. Take a screen shot of a character. Ask a student actor to become that character and then the teacher interviews them with scripted questions that help students gain a deeper understanding of the character. One day someone will make a better film of the wonderful book Holes! Our Inaugural SA TPRS conference has just finished. It was 3 days full of information, explanations, demos and coaching. My brain is full to bursting and my body is absolutely shattered (note to self: participating in a language class is a physically and mentally exhausting brain workout) I am now in a particularly weird emotive state where I would just love to be heading back again this morning for another day of listening to Terry & Lizette and yet on the other hand, I am so excited to have some time to start thinking about the ways in which I can incorporate the skills that were demonstrated over the past 3 days into my teaching. What an outstanding team Terry Waltz & Lizette Liebold are! They work together seamlessly and complement each other beautifully. Terry skills as a presenter dovetailed nicely with Lizette’s coaching skills. Combined they have countless years of TPRS teaching, in fact Lizette is one of the original pioneer TPRS language teachers who hopped on the TPRS train right back when it first began and has consequently attended all NTPRS conferences bar one! Terry’s skills as a presenter are remarkable. While this was her 3rd consecutive Australian conference, delivering (I assume) exactly the same program, at no time did I feel that it was rehearsed or a repeat of a previous presentation. Terry’s manner assured us that she was genuinely enjoying her time with us and that we in no way compared poorly against previous cohorts. Which is exactly what happens in a TPRS classroom! While the target structure may be the same with consecutive classes, each class provides different details which lead us in different directions each and every time. My brain is reeling with all that I heard throughout the conference and thank goodness I took notes, because right now it is still aching and overwhelmed. If I reflect on the biggest take away for me from my 3 days at the conference, it would without a doubt be the clarification of the 3 steps of TPRS. I now understand that the stories I’ve been using for the story asking are in fact the final reading text. Prior to the conference, step 3 for my classes was the story the class had created and revolved around various TCI activities to keep it engaging while achieving repetitions within that one story. I completely understand now the value of reading a different story (the original story or maybe another modified class’s story) for step 3.This enables students to consolidate the acquired language in a totally new setting. Depending on the level of your students, this final step also has the potential to provide your student with longer stories with a variety of the newly acquired target structures in it, each targeted separately prior to the final reading in steps one and two. This understanding is going to turn the way I plan upside down and I am sooo excited. Can’t wait to get started to experience it! Lucy lihat laki laki kecil. Nama laki laki kecil Will. Will punya jaket tetapi jaket Will terlalu kecil. Pak Hudson punya jaket tetapi jaket Pak Hudson terlalu besar. Jane punya jaket dan jaket Jane pas. Because my students have acquired the remaining language from previous stories, I can incorporate it into fun songs and TPR activities to target each group of target structures one by one. I usually begin with panas/dingin which is easily incorporated into the roll call if the weather is extreme and the students come in hot and sweaty or conversely wet and cold! My lessons generally begin with a roll call asking “Apa kabar?” This in itself is an awesome opportunity for circling. Kelas, Joe panas! Joe dingin atau joe panas? Joe dan Mary panas dan Betty dingin! These type of activities are then repeated for each list of target structures. which are each targeted separately because each set may take several weeks till acquisition. For target structures like the ones in group 3, I love looking for weird and wacky pictures on google images that incorporate familiar and popular characters from recent films/books/tv programs and then use them to create a powerpoint. Harry Potter is reliably popular and easily identifiable by all year levels at my school so one powerpoint had a page with harry potter wearing a tiny hat, the next page with him wearing an enormous hat and the following page showed Harry wearing a hat the perfect size! Thus I was able to consolidate ‘topi’ while introducing new structures! The following pages were pictures of familiar characters or cognate animals (orangutan, komodo) wearing oversized, undersized or perfectly sized jackets, hats or shoes. My students are generally riveted to the screen, wondering what kooky picture will be next. It also provides opportunities to circle using mau and punya. Billy punya topi pizza besar? Billy mau punya topi pizza besar? After the structures have been acquired to my satisfaction, I move on to step 2 – story asking – using actors. The actors help in a variety of ways; they make the story engaging for the class (& me), they help me circle each part of the story (especially if the acting requires more expression – I love OTT acting – sneaky way to get reps), they can also be a tool for me to measure class acquisition. Story asking is incredibly important as it allow classes to create unique stories through collaboration, its how students buy into the story. Afterwards, the class story can be written up to be used in a variety of ways as listed on the TCI activities page. Then finally step 3 (the one I will work on this year) is reading together the original story as printed above. I loved how Terry did this. 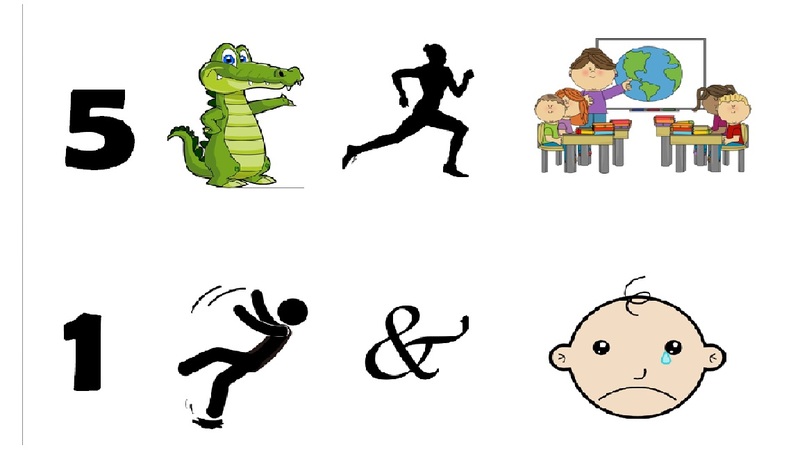 She had a powerpoint ‘book’ that the class could read together and each page had a line of text with a quirky picture that provided opportunities for circling, popup grammar, funny stories/gestures to help students remember conjunction words (eg. tetapi = point to your but) or other useful words that need a boost. (imagine the ‘cultural’ story you could create for bercakap-cakap!!). For me as a student, this final step was incredibly powerful. It made me feel super confident that I could read it and understand the story even though the characters and setting were not familiar. With those changes, the story felt foreign yet still achievable. Soo cool. It truly demonstrated for me the concept of i+1. Fully comprehensible yet stretching my acquisition just the right amount. With this text, there are a variety of reading activities that can be done with students to further consolidate acquisition. With Terry, we choral read the book on the tv screen, firstly in pinyin and then with Chinese characters. Boy, did this hit home for me how fortunate both my students & I are that Indonesian is a roman alphabetic language!! Musical readings – students in pairs each reading a sentence each one by one with each student double checking the sentence was read correctly & if not, the sentence is reread. The teacher plays music and when the music stops, whoever is not reading gets a point. Reading Bingo – each student has a 3×3 =grid. In each box, the student writes a different word from the story in each square. Students cross out the word when they hear it. Stupid Teacher (Guru Gila?) teacher reads the story and deliberately says a word not in the story or changes one word. Students in pairs, competing against each other, tally up the mistakes and compare tally at end of reading. Comprehension Questions – to measure comprehension, ask the questions in English. They could include true/false questions, short answer questions, multiple choice questions, cloze from story with multiple choice options for each cloze empty space. Now all I have to do is decide which story I want to begin with this term!! What story are you using? 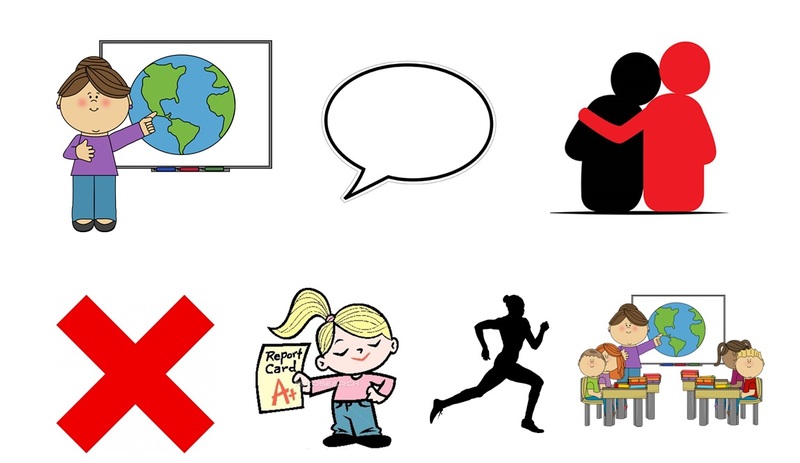 Have you seen the oral cloze retell idea by Eric Herman on my TCI/TPRS activities page which is found on my homepage up the top in the header? On subsequent retells you can erase more and more words to give more advanced students a greater challenge and eventually erase the entire story and have superstars retell the entire story without any written support. There is a boy. His name is Bob. He likes pizza. There is ___ boy. His name __ Bob. He likes _____. There __ ___ boy. ___ name __ Bob. He ____ ____. There __ ___ ___. ___ name __ Bob. __ ____ _____. I tried it today with a year 1/2 class as well as a reception class and it was awesome! I began by asking 2 students to act out the story while I retold it. By now, I’ve lost count of the number of times they have heard it, but it never hurts to get in one more retell!! 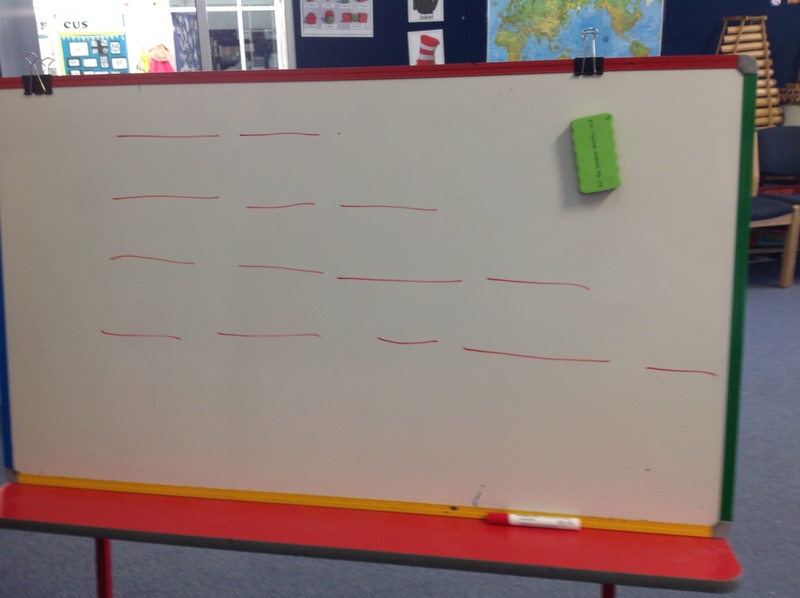 I then dragged over my mobile white board and asked the class to tell me the story again. It was brilliant how well they could retell the story! I wrote down the first 5 sentences on the board. Elsa berlari ke Horseshoe Bay. We all then read the story together using hand gestures. At the end of the first reading, I rubbed out one word and in its place I drew a contrasting coloured line. 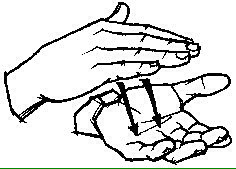 We then read through it again together, however before we all read it, I explained that the next person to rub out a word would be someone who is both reading and gesturing beautifully. Boy – that ramped up the participation and engagement!! We continued this until there was nothing left of the story and all that was there were red lines where the words used to be!! Both classes absolutely loved it and were so fluent by the time we rubbed out the last word! After watching Carol Gaab, I tried something new with my junior primary students this week that I would like to share with you. Last week with my younger students, I started the Carol Gaab story that Bu Anne posted about on her blog. I have tweaked it slightly to minimize the amount of new vocabulary. Instead of a harimau (tiger) I have a buaya (crocodile) because most students know buaya from our kancil and buaya unit last year. I also believe that tree, mountain (&?) 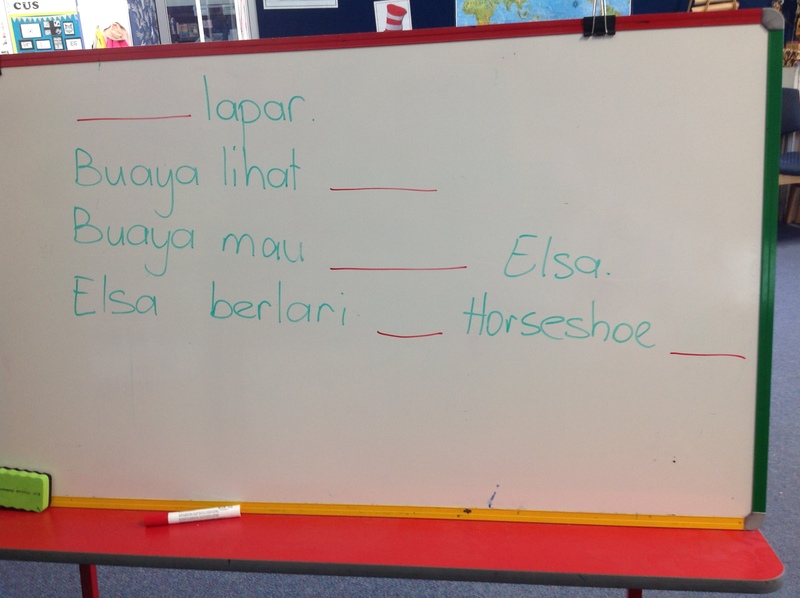 are very low frequency nouns in a classroom, so I changed it to Horseshoe Bay, sekolah (school) & kelas (class). Elsa berlari ke Port Elliot. Buaya berlari ke Port Elliot. Lima buaya berlari di kelas. Tidak pandai berlari di kelas. Thinking back on our conversations with Catharina, the various posts I’ve read & my recent talks with Bu Anne, I liked the idea of introducing jatuh & menangis which we hear often in the junior primary classroom, especially after recess & lunch! On Monday, I began introducing the rhyme but students weren’t particularly engaged and I considered disregarding the whole thing but yesterday morning as I turned on my computer at school, I remembered something I had seen Carol Gaab do. She had replaced the words of the story with illustrations. I immediately did the same using clipart images. Not only did it look more appealing to me, but it did for my students as well. Then when I added acting into the equation, I was blown away with the increased level of student engagement. I firstly trialled the idea with a reception class, most of whom are pre-literate. They loved it and all read along with me! I then asked them to ‘cari empat teman dan duduk’ (find 4 friends & sit) doing a comprehension check firstly that they understood that you + four friends = groups of 5 and then they acted it out in their groups. Sharons ‘mata-mata’ (spotter) concept was brilliant here because invariably there were a few students above the multiple of 5. They went from feeling rejected to feeling very special when I asked them to be my mata mata! At the end of each acting of either the first half of the rhyme or the entire rhyme, each mata mata could choose a new mata mata and swap with that person. One more point I’d like to add is that of hand gestures. Our PLC members work at schools that are not particularly far from each other and we have a few students moving between our schools for various reasons. We have discussed several times how much smoother the transition would be for those students if our had gestures were similar. One idea that appeals to us all is the use of AusLan or ASL. When looking for gestures for sekolah, kelas, menangis & jatuh, I investigated several websites. I believe that all gestures mustache be meaningful as they are clues which help students comprehend. The sekolah and kelas AUSLan & ASL signs were not useful at all. So I asked students and we made up our own for sekolah & kelas. However I found great ones for jatuh and menangis. The following screen shot comes from a video which was shared a couple of weeks ago on the Ohio TCI Facebook page and seems not available anywhere else! As soon as I watched it, I was determined to give it a go. I love trying new TCI activities! The first time I tried it (week 5), it became quickly apparent that I had not prepared my students well enough by providing them with sufficient reading opportunities because for this activity to succeed, students must know the story very well. So, to achieve this, students did a listen and draw and played strip bingo which provided students opportunities to hear the story repeatedly. Then this week we attempted paper plane reading once again and it was a hoot. Giving the instructions was largely done in English, which was frustrating, however one class did not give me permission to speak in English, and we didn’t do too badly, even though with the final instructions and clarifications, we did use English! The two best things about paper airplane reading, is that movement is interspersed with reading and that students are asked to make paper planes; something which has never been encouraged in my lessons befre!! Hand out a sheet of paper to each student with the class story printed on one side, as well as a clipboard & a lead pencil. 1. We first chorale translated the story together. My instructions to students were: Bu Cathy membaca pakai Bahasa Indonesia dan murid murid membaca pakai Bahasa Indonesia. Murid murid ekho Bu Cathy. 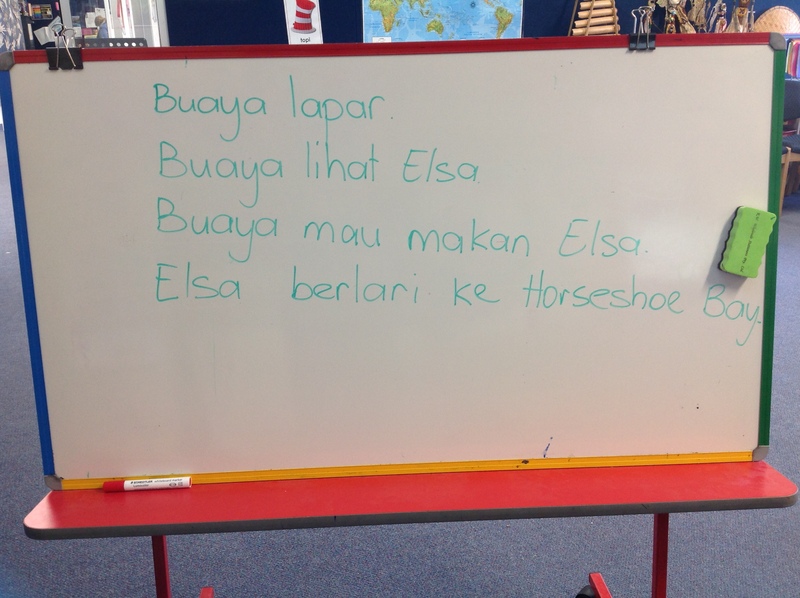 (Ekho – one of the new words I learned this week from our visitors Yoedha, Dian & Zvana!!) I then read the sentences one by one and asked the students to choral read once I paused. If we came to a word I knew would be tricky or if students were skipping a word then I broke that sentence up into a phrase. 2. I then asked the students to read the story and choose one sentence from the story that they could translate easily but not to mark in any way the location of that sentence on the sheet of paper. They then had to turn the sheet over and at the top, write in ENGLISH the translation for that sentence. I then gave an example using the first sentence in their story. I chose the first sentence (Ada perempuan dan nama perempuan Harry Potter) because students are often muddling up the word ‘ada’ (there is) with ‘apa’ (what?) and we translated it together. I then gave everyone time to choose a sentence and write its translation on the blank side of the sheet of paper. 3. While students were finishing step 2, I explained, “Kalau sudah, clip board dan pensil dibawah kursi” (clipboards & pencil under you chair) and then asked them to make a paper airplane from their sheet. It was surprising both the variation of paper airplane designs we got and that there were a few in every class who did not know how to make a paper airplane. It worked well to encourage those who knew how to make a paper airplane to help those who didn’t by demonstrating the steps with their own paper so that their friend could do the same with theirs. This way, we all finished about the same time.